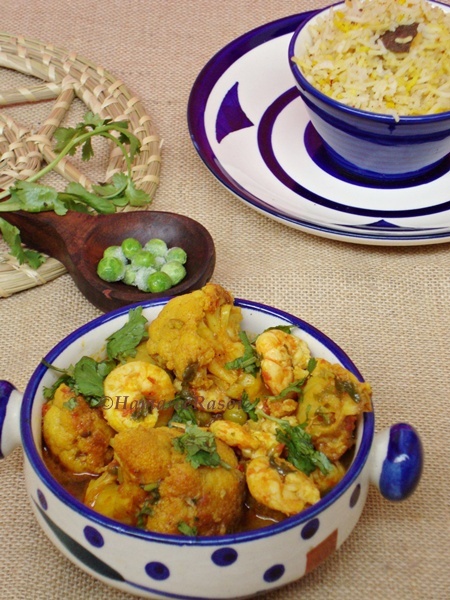 The cauliflower-peas curry is definitely a good dish but for non-veg lovers adding prawns makes it more wonderful combination. You can add potatoes here which also blends quite well with cauliflower and prawn but I generally skip it. Sprinkle some salt and turmeric powder on cleaned prawns. Keep aside for 10-15 minutes. Cut cauliflower into medium sized florets, dip them in hot water with 1/2 tsp salt and put this on burner for 5-6 minutes until they are slightly tender (over cooking will cause it to break apart). Drain and keep aside. Heat mustard oil till smoking point and then reduce the heat, fry prawns for few seconds and keep aside(prawns are very tender so don't over fry them or else will become rubbery). In the same pan fry cauliflower florets on medium heat till they are light brown. Place them on tissue paper to soak the excess oil. Now add bay leaves in the same oil, add onion paste and fry on medium heat till it turns pink. Add ginger paste, chilly paste and all dry masala (except garam masala). Fry till it leaves oil, then add tomato paste. When the masala is nicely fried add cauliflower, mix well thoroughly. Add little water and green peas, adjust salt, cover and cook over medium heat until the vegetables are done. Just before removing from the heat add fried prawn at this stage, sugar, garam masala and ghee for flavor. 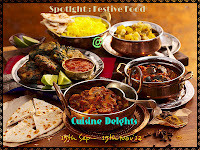 Garnish with coriander leaves and serve with steamed rice or simple masala rice. Very yummy & delicious prawns,lovely!! 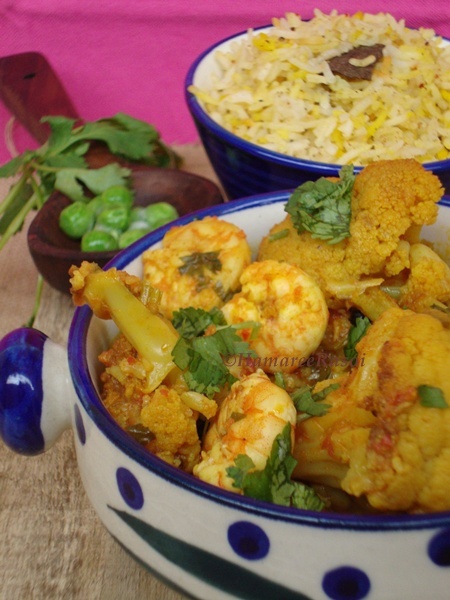 Cauliflower and prawns...got to try it..ASAP. beautiful recipe and so well presented. 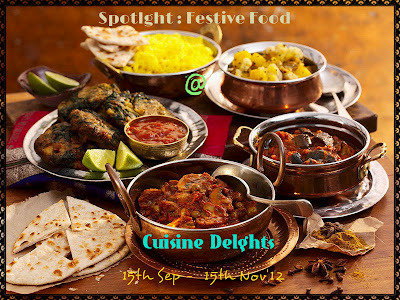 looks awesome Deepa. i love any kind of prawn curry n this variation sounds great. Very well presented Deepa, perfectly made dear. Wow, unique combination and looks very inviting! Looks so good, wish i had this right now. Very nice preparation. Loved the durga ji postcard in the background. 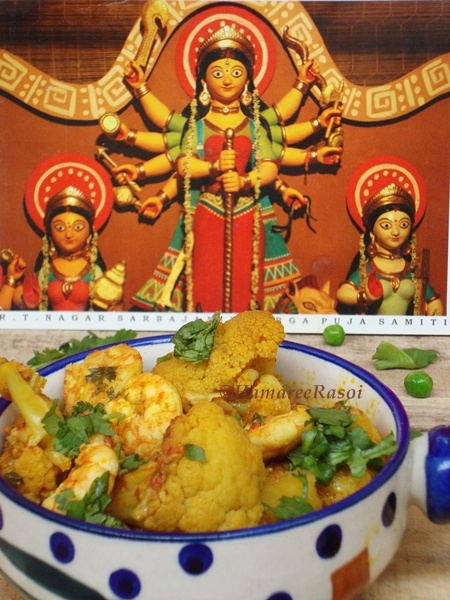 Another different combo from you.I love cauliflower and i am sure the combo will be superb. Eta besh ekta notun torkari for me. I don't think ma eta baniye che kono dino. Dekhte darun lagche. Try korno ek din! 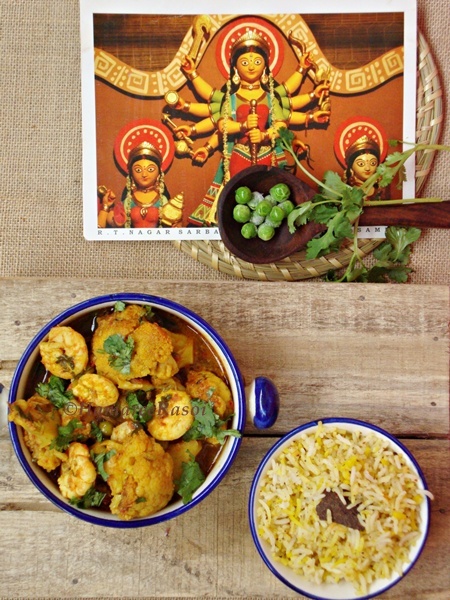 aha mota mota plump chingri .. looks really good and besh pujor bhoj pujor bhoj kind.